JM Surf N’ Roll is the result of a dream come true. We cannot accurately date when it was born as a surf brand, although its origins date back to 1996 when a young man named Jordi Miró (who passed away in 1998), built a homemade longboard with a group of friends (surfing pioneers in on the Barcelona coasts) without any knowledge about shape. In 2006, Pol Miró decided to revisit this idea and began studies on materials for the manufacturing of surfboards, paying special attention to the resins used. These studies were held over many years at the laboratory of the family’s chemical company, Royal Diamond. 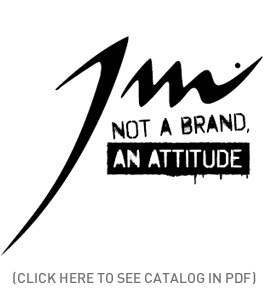 After many trials and very positive results, the decision to create a surfboard brand with the initials J.M. (in honor of the young deceased Jordi Miró) was made. Acceptance among the surfers in Barcelona and its outskirts, together with the growing demand for surfboards, resulted in the establishment of the JM Surf n’Roll society in 2014. Therefore, as our slogan suggest, we expanded our field with what we think, based on history and purity, is the only true sibling of surfing: the skateboard. We want to express who we are through JM. What are we? We are an attitude, a lifestyle, a set of values, a tune, and above all, the pride of being from Barcelona; we surf its waves, and skate its ramps and streets. We like to think that we are not just another surf brand with the desire to become a huge name, selling typical Hawaiian t-shirts with flowers and palm trees. JM comes from the heart and seeks to convey what we have experienced and what we truly are, nothing more.